Just when you thought investigative journalism was dead, Robert Parry comes through with another article spelling out Conservative criminality and the "October Surprise" at Consortiumnews.com, "Reagan-Bush Ties to Iran-Hostage Crisis." "Exclusive: The Senate wants to block Iran’s new UN ambassador because he was linked to the Iran hostage crisis 35 years ago, but that standard would strip honors from Ronald Reagan and George H.W. Bush, implicated in extending the hostage crisis to win the 1980 election, reports Robert Parry. 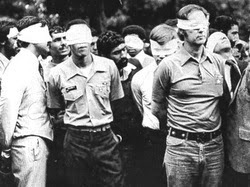 "U.S. government officials are in high dudgeon again – this time over Iran’s audacity in naming an ambassador to the United Nations who allegedly played a minor role in the 1979-81 crisis in which 52 Americans were held hostage for 444 days in Iran. But the same U.S. officials ignore the now overwhelming evidence that Ronald Reagan and George H.W. Bush helped extend the hostages’ suffering to gain an edge in the 1980 election. "The double standard – getting worked up over the allegations about Iranian Ambassador Hamid Aboutalebi and going silent over the evidence implicating Reagan and Bush – is just the latest in a long series of examples of the U.S. government’s hypocrisy. 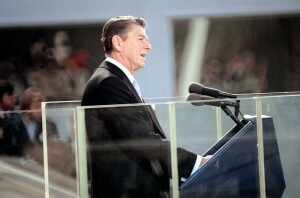 Reagan, delivering his Inaugural Address on Jan. 20, 1981. "Indeed, one might think that the near treasonous behavior of Reagan and Bush was more objectionable than whatever Aboutalebi did as a young man in Tehran. He has denied direct participation in the seizure of the U.S. Embassy in Tehran in 1979 though he apparently provided some assistance with translations and negotiations. Aboutalebi is now a close adviser to Iran’s President Hassan Rouhani and has served as Iranian ambassador to Belgium, Italy, Australia and the European Union. "It is rare for the United States to block an ambassador to the United Nations, which is located in New York City, but Aboutalebi’s selection has become the latest excuse for congressional hardliners to throw a wrench into negotiations aimed at limiting but not eliminating Iran’s nuclear program. On Monday, the U.S. Senate passed a bill sponsored by Sen. Ted Cruz, R-Texas, to deny Aboutalebi a visa for entering the United States. 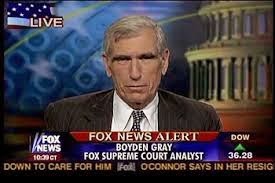 Following the Senate’s lead, the Obama administration also has criticized the nomination. "The irony, however, is that Cruz and pretty much every leading Republican model themselves after President Reagan whose election in 1980 now appears to have been aided by his campaign’s behind-the-scenes maneuvering to frustrate President Jimmy Carter’s negotiations to gain the hostages’ freedom. 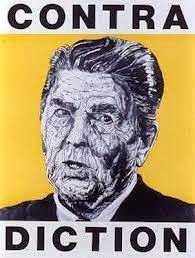 Those talks broke down in October 1980 and the hostages were only freed after Reagan was inaugurated on Jan. 20, 1981. 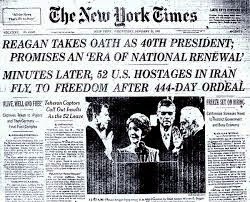 "Reagan’s purported 'October Surprise' operation to torpedo Carter’s hoped-for success in getting the hostages out before the Nov. 4, 1980, election would have made the Republican icon a much bigger villain in the hostages’ ordeal than Aboutalebi. George H.W. Bush, who was Reagan’s running mate in 1980, was also implicated in the sabotage operation. "The evidence of this Republican skullduggery has been building for more than three decades, with the 1980 contacts between the Reagan team and radical Iranians appearing to be the opening chapter of the Iran-Contra saga of 1985-86, which also involved secret contacts and the trading of arms for hostages. "Both operations also were shielded by aggressive Republican cover-ups that extended from 1986 to 1993, although congressional and government investigators did a much better job in excavating the Iran-Contra secrets than they did with the October Surprise case. It wasn’t until last June that Rep. Lee Hamilton, D-Indiana, who headed both congressional inquiries, admitted that he had been misled about key October Surprise evidence. "In a phone interview, the retired Indiana Democrat responded to a document that I had e-mailed him revealing that in 1991 a deputy White House counsel working for then-President George H.W. Bush was notified by the State Department that Reagan’s campaign director William Casey had taken a trip to Madrid in relation to the so-called October Surprise issue. "Casey’s alleged trip to Madrid in 1980 had been at the center of Hamilton’s investigation in 1991-92 into whether Reagan’s campaign went behind Carter’s back to frustrate his hostage negotiations. In early 1993, Hamilton’s task force dismissed the allegations after concluding that Casey had not traveled to Madrid. "Asked if knowledge that Casey had traveled to Madrid might have changed the task force’s dismissive October Surprise conclusion, Hamilton said yes, because the question of the Madrid trip was key to the task force’s investigation. 'If the White House knew that Casey was there, they certainly should have shared it with us,' Hamilton said, adding that 'you have to rely on people' in authority to comply with information requests. "The document revealing White House knowledge of Casey’s Madrid trip was among records released to me by the archivists at the George H.W. Bush library in College Station, Texas. 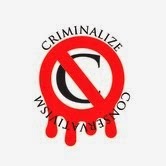 The U.S. Embassy’s confirmation of Casey’s trip was passed along by State Department legal adviser Edwin D. Williamson to Associate White House Counsel Chester Paul Beach Jr. in early November 1991, just as the October Surprise inquiry was taking shape. "Williamson said that among the State Department 'material potentially relevant to the October Surprise allegations [was] a cable from the Madrid embassy indicating that Bill Casey was in town, for purposes unknown,' Beach noted in a 'memorandum for record' dated Nov. 4, 1991. "Two days later, on Nov. 6, Beach’s boss, White House counsel C. Boyden Gray, arranged an inter-agency strategy session and explained the need to contain the congressional investigation into the October Surprise case. The explicit goal was to ensure the scandal would not hurt President Bush’s reelection hopes in 1992. "At the meeting, Gray laid out how to thwart the October Surprise inquiry, which was seen as a dangerous expansion of the Iran-Contra investigation, which Rep. Hamilton had co-chaired when the scandal was reviewed by Congress in 1987. 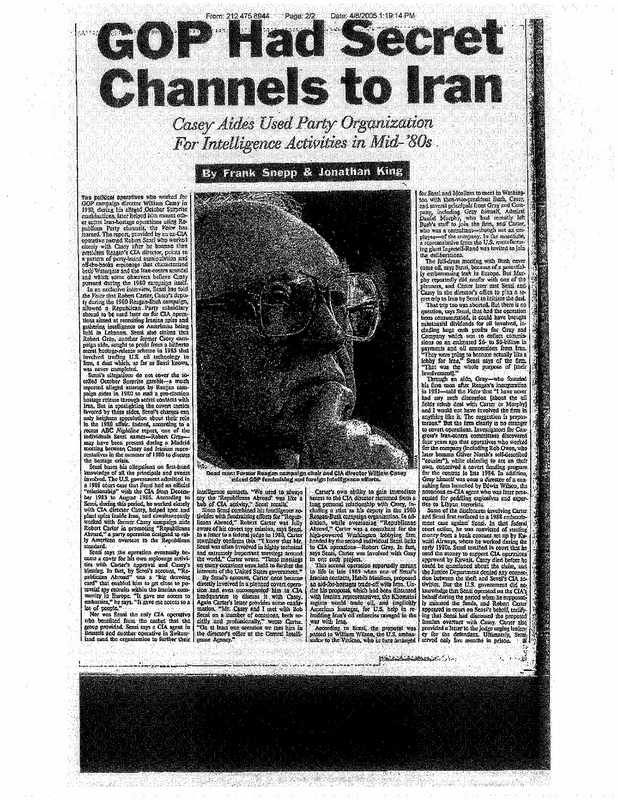 A parallel criminal investigation by special prosecutor Lawrence Walsh was continuing in 1991 and some of his investigators were coming to suspect that the origins of Iran-Contra contacts with Iran traced back to Reagan’s 1980 campaign. "Up to that point, Iran-Contra had focused on illicit arms-for-hostage sales to Iran that President Reagan authorized in 1985-86. However, some October Surprise witnesses were claiming that the framework for Reagan’s secret arms shipments to Iran, usually through Israel, took shape during the 1980 campaign. "The prospect that the two sets of allegations would merge into a single narrative represented a grave threat to George H.W. Bush’s reelection campaign. As assistant White House counsel Ronald vonLembke, put it, the White House goal in 1991 was to 'kill/spike this story.' To achieve that result, the Republicans coordinated the counter-offensive through Gray’s office under the supervision of associate counsel Janet Rehnquist, the daughter of the late Chief Justice William Rehnquist. "Among 'touchstones' cited by Gray were 'No Surprises to the White House, and Maintain Ability to Respond to Leaks in Real Time. This is Partisan.' White House 'talking points' on the October Surprise investigation urged restricting the inquiry to 1979-80 and imposing strict time limits for issuing any findings, according to the document. "But the key to understanding the October Surprise case was that it appeared to be a prequel to the Iran-Contra scandal, part of the same storyline beginning with the 1980 crisis over 52 American hostages held in Iran, continuing through their release immediately after Ronald Reagan’s inauguration on Jan. 20, 1981, then followed by mysterious U.S. government approval of secret arms shipments to Iran via Israel in 1981, and ultimately morphing into the Iran-Contra Affair of more arms-for-hostage deals with Iran until that scandal exploded in 1986. [For more on the scandal and cover-up, see Robert Parry’s America’s Stolen Narrative.]" Next: Lies, Lies, And More Lies. 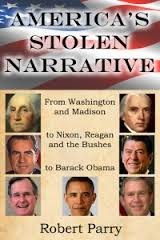 Few Conservatives in our modern era have made their way to the White House without stealing their election, but few know how Reagan stole the election in 1980 -- though no one knowing the criminality of all Conservatives should be too surprised by it. But a whole bunch of fools voted for the mean old man, and even though they might have voted for Bonzo knowing all about the October Surprise, without that knowledge there was enough to reveal his criminality to every voter. 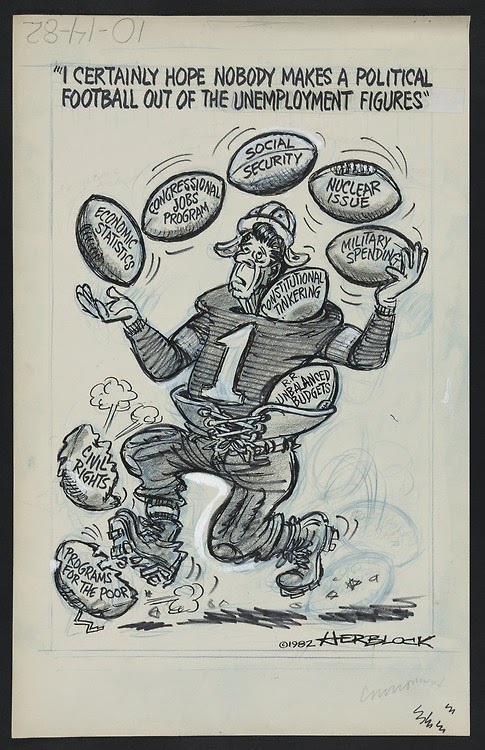 We still haven't recovered from the harm Reagan and his gang of crooks and thieves, and the Low Information American voters have no one to blame but themselves. present, or nothing but the past."